When a film has been built up to the rafters, there’s always a danger of being spectacularly let down. 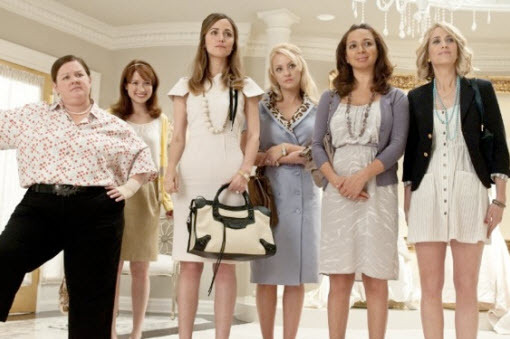 Before seeing Bridesmaids I’d been told by numerous trusted sources that this is the not-to-be-missed comedy of the year, that it’s pants-wettingly funny. And it was. But it was also so much more. The story revolves around Annie (SNL’s Kristen Wiig) who is bestowed with the coveted role of ‘Maid of Honour’ to her best friend since childhood, Lillian (Maya Rudolph). Although happy to accept the position, at the same time Annie’s life is falling apart at the seams with a failed business, flatmates so disgusting they make your eyeballs itch, and a quasi-boyfriend allergic to commitment… but all this pales in comparison upon meeting her arch-nemesis, Helen (Rose Byrne). Everyone’s had a Helen in their life – they’re basically the type of girl who exudes perfection, to the point where you want to respond to everything they do with an, “are you effing kidding me?”. Nothing riles a girl more than another (smug, shiny-haired) girl encroaching on their territory… the territory in this case being Lillian. The scene where Annie and Helen battle it out in a ‘toast-off’ during the engagement party was the moment when I knew with absolute certainty that this film was going to be a winner on so many levels. This is also when we meet the rest of the wedding party, including Megan (Melissa McCarthy) who kills every scene she’s in. Think Alan in the first Hangover, except not a ruh-tard. You can predict at the beginning how it’s going to end, but that doesn’t matter. Some of the scenes are so crude your face automatically scrunches up, but it’s never too much. If I’m going to be picky then it could have been 15 minutes shorter with subtle editing, but that doesn’t stop it from being a triumph. I go to the cinema to be entertained, and for me that means to either laugh at “gross-out” moments, or have my heart warmed by a girl-meets-boy-girl-loses-boy-because-of-misunderstanding-boy-wins-girl-back-in-finale scenario (such is my penchant for low-brow films). Well, it appeared that all my birthdays and Christmases came at once with Bridesmaids, because I got both. The journey that you take with the main characters is no meaningless fling, it’s a profound two hour relationship. Despite shying away from the label “chick-flick”, there is a romantic storyline for Annie, who is won over (along with every single female in the audience) by the ridiculously endearing cop, Nathan (Chris O’Dowd). The customary chick-flick would require Matthew McConaughey to save our heroine from her self-confessed ‘rock bottom’ with forced affection and his pumped-up T-Rex arms. Not so with O’Dowd. His sparkly-eyed wit, charm and honesty delivered with an Irish lilt is all that’s needed. You know he’s the one for our heroine when she becomes even more comical and charismatic in his presence. In fact, the ‘drive-by’ scene is one of the funniest of the movie, and I don’t like to pick favourites. There are a number of reasons why this film works, but the main one is Wiig. I have a feeling that Judd Apatow came up with Annie’s role solely on the back of Wiig’s performance in Knocked Up (“Oh no, we’re not asking you to lose weight. That would be illegal. We just want you to be healthy, by eating less”). She comes from the Chelsea Handler School of Comedy, but much funnier. She touches on Heigl territory, but with better delivery and more convincing self-deprecation. She gets away with the filth and raunch because she fully commits to these seat-squirming scenes. If you’re anything like me, then you’ll come out of this movie determined that one day Wiig will be your best friend. Finally we have an actress who proves that it’s not just Seth Rogan’s band of brothers who can do laugh-out-loud humour, and it’s incredibly rare to find a female character who is at times painfully melodramatic and almost revels in her downward spiral, but yet you’re rooting for her at every step. Because she’s believable. This film stays with you for a little bit afterwards. It isn’t just downright hilarious, it also has heart. And not the schmaltzy, contrived kind that you find in traditional rom-coms, that requires the peppy optimism of a Taylor Swift song in the background to prise some cheap tears out of you. It’s real. The feelings are the same that you get in any group of girlfriends; the jealousy, narcissism, insecurities, disagreements, self-pity, singing along badly to Wilson Phillips (pure comedy gold) that characterise female rapport are plain as day in this movie. It shows that people do make mistakes, but that doesn’t mean that the bond of friendship (especially the kind that go back years) is any less deep. The over-riding message is that at the end of the day, you’ll do anything for these broads. As for the inevitable sequel? Bring it, Judd Apatow. Just please make it as cockle-warmingly good. I’ve wanted to see this movie for weeks. Kristen Wiig is my favorite current SNL cast-member. Thanks for such a detailed review!